An interesting social phenomenon has developed along the banks of the Mersey, at the rear of the Tate Gallery in Liverpool. 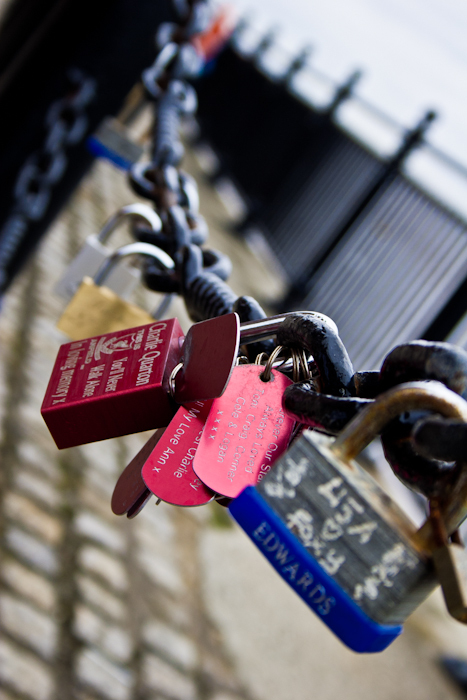 People – locals and tourists, it seems – have taken to leaving tokens of their love and devotion to each other on padlocks which are fixed to the chain fence near the water’s edge, looking out towards Birkenhead on the opposite side of the river. Some are the equivalent of the old ‘heart on a tree’ tradition, though of course there is the added symbolism of the lock. Echoing ‘wedlock’ from former times, when that was treated with more reverence, maybe we can see this as symbolic of a time when public statements are still important, but the reality of the devotion promised is less certain. The fact that many locks are written on in just indelible marker, with its limited lifespan (especially in a harsh, marine environment) is perhaps indicative. Other messages seem more serious and permanent, dedicated as they are to those who have passed away, and some of these are remembered not with marker pen but with engraved locks. Overall, it makes for a playful and sometimes poignant sight, and one of those lovely things one occasionally sees, where anonymous members of the public, not officially sanctioned creatives, have taken the initiative. And many besides me were making their own photographic record of this social/environmental/architectural phenomenon. It is interesting too that, whilst many profess not to get 'conceptual art' of the type that might be seen next door in the Tate, that's effectively what this is, and anyone can do it.